Lustration of the Ancestors Silent Auction! an eclectic group of merchandise donated to help provide financial support to CNT. Our heartfelt thanks go out to the individuals who have provided items for this event. Winningbidders will be notified by Monday April 16, 2018. by email and final results updated to the webpage. How to bid - It’s Easy!! ​1. Specify the item #(s) and name of the item(s), along with your bid(s). 3. Full Address, for use in mailing should you be the top bidder. letting you know the results of the bid. submit a re-bid(s) or bid on something else. Reminder – 100% of the proceeds are for the Correllian Nativist Tradition! 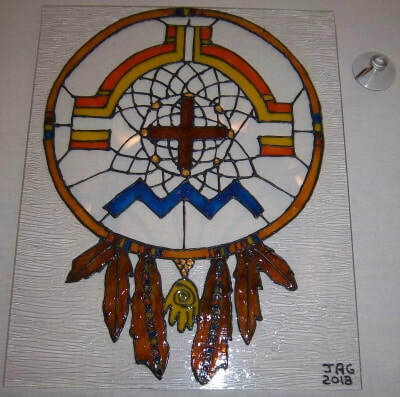 The donor is also the artist / creator of this custom piece with the Tradition’s Correllium hand-painted in a stained glass effect and set within a dream catcher. It has been painted (Non-toxic water based paint) on a thick Plexiglas with the outer edges of the design textured to add dimension and lighting effect when light passes through. The piece measures 8” X 10” and can be framed easily by removing the back of a standard size certificate frame. Included is a plastic suction cup to hang from your window. This is a beautiful ceramic singing bowl done in an antique brass finish with intricate designs both on the outside and interior bottom. Included is a soft ring to ensure resonance of sound that is wrapped in an orange with gold brocade fabric, and a mallet. The bowl measures approx. 7” circumference, X 3 ½” high (4 ¾” high when on the pillow). The mallet is approx. 7” Long X 1” thick. Hand crafted by Bowen, from drawings of the mystical Moonbeam Mermaid, this white /cream, lap-length afghan is sure to make you smile. It has a pocket for your footies in the back, and then opens up so you can either tuck it around you for the complete “Weeki Watchee effect” or leave it loose and comfortable. This is super-soft and lightweight, despite the scales. Adult Size - Machine washable and tumble on gentle/low until just dry. 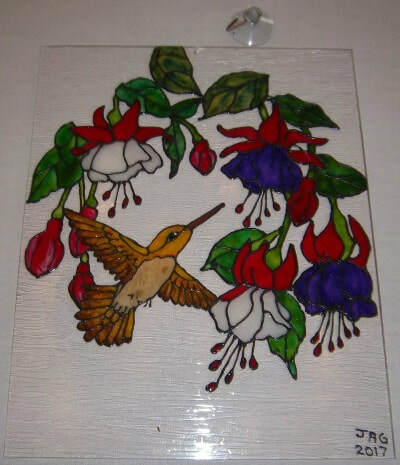 Bowen is an artist with a 45 year passion for “hooking”…and he’s usually working on commissioned pieces for friends, family, and customers who love handmade works. 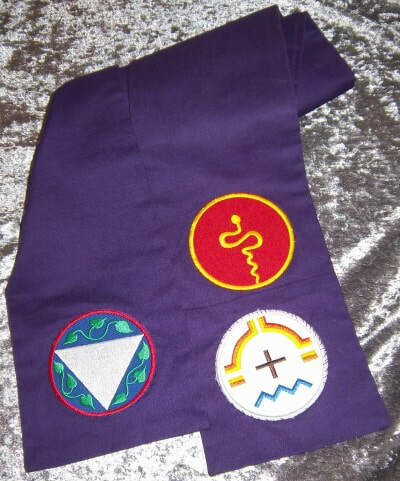 This is a purple clergy stole worn by Correllian Priestesses and Priests and includes 3 sigil patches already sewn on: the Tradition’s Correllium, Mother Temple and 1st. Degree. Sometimes things get misplaced and then found after it has been replaced. Purchase price from the CorrStore = $48.00. Used but in excellent condition, not a single drop of candle wax!!! Hand crafted by the donor. The rattle head is made of elk hide, with a handle of two-toned driftwood from the beaches of Jacksonville FL. Would be wonderful for a ritual or drum circle, or to accompany your dance. Overall length is approx. 21” long, including the 6” rattle head. This book released 2016 will be signed by the author, a member of the Correllian Tradition. Reclaiming Your Sacred Path shares how to renew your autonomous relationship with Spirit. An excellent book for the individual who has reached a plateau and desires to move forward or for the individual who has gotten waylaid and is looking for tools to get back on track. Created by the donor / jewelry maker, the piece is called “My Heart” The heart is etched front and back with a fine design in silver tone that appears black to the eye on a multi strand 16” ribbon & cord combination. The metal heart opens on a hinge for you to place that special picture or small talisman. The heart is approx. 1 ½” X 1 ½”. This item is new, removed from the packaging to take a picture. See additional pieces by this jewelry artist further down as well as a few more pieces will be available at the in-person auction. Myths & Mermaids – Oracle of the Water by Jasmine Becket-Griffith. From the back of the box: “The mystical element of water is both bringer of life and bearer of death, the herald of hope and the harbinger of destruction. It is our nature to seek to understand it to conquer it, and to sip its mysterious powers”. This is 44 card oracle deck comes with a 110+ page guidebook nestled in a sturdy box. Deck, book and outer box are in excellent used condition. Handcrafted by our donors, here we have a natural stone bracelet Magnesite and Halite with wood beads and white metal decorative clasp. Magnesite aids in powerful meditation and Creative Visualization, and Halite aids in memory. Having trouble remembering dreams – take off your Fitbit and wear this as you sleep. Bracelet measures approx. 9 ¾” long with lobster claw closure. You like Dragons and the energy they represent? Well here is a pair to work their powers on your altar or ritual room. They are made of a composite material and painted / stained in silver. They are about 3 ¼” tall 2 ½” - 2 3/4“wide. One depicted with their forelegs together, the other forelegs apart. They are small enough for adding to your traveling altar or add to an awesome collection. This book donated and written by the First Priestess of the Correllian Tradition will be signed / inscribed to the winning bidder’s request. 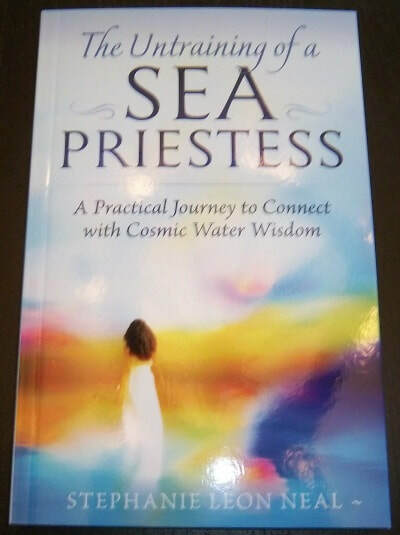 From the back cover: “The book details the extensive knowledge from the author, gathered from her many years training in the Sea Priestess tradition. Every page contains an opportunity for transformation by teaching you how to untangle from your attachments and embrace the joy of cosmic water wisdom. Can’t wait for the auction to end – check out the CorrStore: Book is new ($20.95) retail. Here we have a brass bell on a small leather belt. The bell has a very nice ring to it and would be perfect during ritual to call in the Quarters, Goddess, God, Ancestors, etc. The brass is thick and is about 2 ¾” tall and 1 ¾” at the bottom. The split leather belt with brass tiny tacks is 15” long. Wiccan warrior – Walking a Spiritual Path in a Sometimes Hostile World by Kerr Cuhulain. From the back cover - Being a warrior is not about fighting. It’s about freeing yourself of limitations so that you can be truly creative and effective in life. This softcover book ($18.95) is in lightly used condition. This is another piece created by the donor. The symbol represents “No Negativity” The symbol has been etched onto a 1 ¼” bone convex disc with a 24” leather cord. On the reverse side: “Wards off all negative forces” This item is new, removed from the packaging to take a picture. See additional pieces by this jewelry artist further down as well as a few more pieces will be available at the in-person auction. 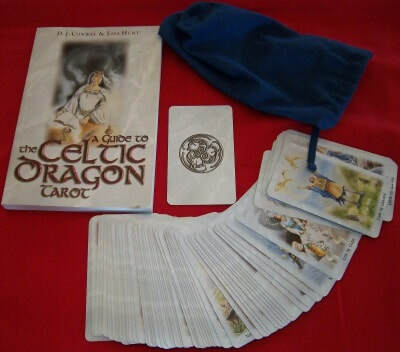 Celtic Dragon Tarot Deck and Guide by D.J. Conway and Lisa Hunt. From the rear cover – “Fire up your spiritual practice and infuse your magickal spellworking with the potent elemental energies of dragons. In tarot readings, candle magick and meditation, let the incandescent beauty of the tarot cards illuminate your path to self-discovery in a unique way”. Tarot Cards with bag are in excellent used condition, as is the 218 page softcover book. Blue Lace Agate: the stone of calming and centering assists the wearer to choose wise words with a clear mind and conviction. It is also beneficial for the throat chakra. The stone has been wire wrapped with a loop to add a cord and wear when you need the energies offered by the Blue Lace Agate in your life. The stone is approx. 1” X 7/8”, plus wire loop. 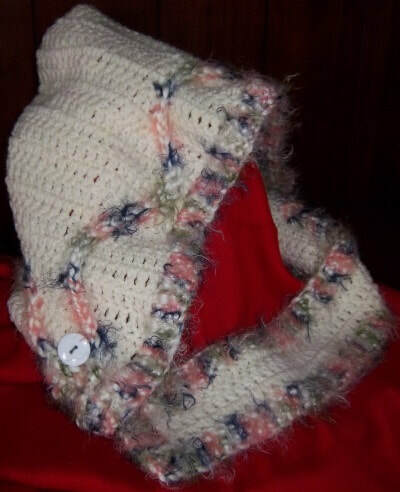 This is a hand knitted hood made by Anastasia in off-white with the outer edges and accented in spring colors. The bottom edge of the hood extends around under the neck with a button closure. This would surely keep you warm from the late spring cold and winds for those who live in cold winter climates. The picture does not do the hood justice. For your bidding pleasure we have a large altar cloth / wall hanging in a Dark Aqua and Black, depicting a mermaid with the outer border of aquatic designs. 100% cotton by Ancient Circles. The overall size is approx. 95” tall X 83” wide. Like new condition. Here is a third piece by jewelry maker, Mitra. A pair of earrings she has titled “Fiesta.” Combining a silvertone flower design, round turquoise and square smokey quartz beads and silver accents, they transform into a beautiful pair of earrings. They measure 3 ¼” at longest point and ¾” wide. This item is new, removed from the packaging to take a picture. See additional pieces by this jewelry artist further down as well as a few more pieces will be available at the in-person auction. Runic States: The Shamanic Perception of Quantum Realities by Kevin Steffen. From the inside preface: This book is about the runes and how they fit into the cosmologies of people today. To do this it is necessary to examine the cosmologies of the cultures that used the runes in the past…. This 178 page softcover book has many “runic” illustrations that accompany the text and is in like new condition. From the box - The Herbal Tarot Deck, created by Michael Tierra and designed by Candis Cantin, integrates the healing properties of traditional herbs with the symbolism of tarot. A different herb is identified and illustrated on each card. Includes the standard 78 card deck and instruction booklet. Deck is in lightly used condition. 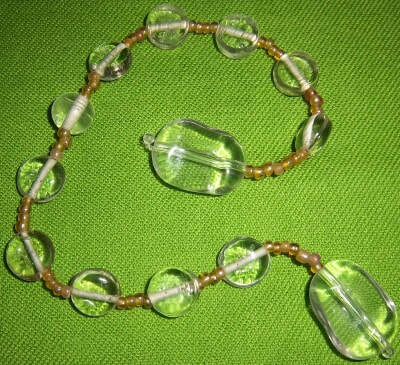 Here we have a very organic necklace, combing stone and metal created by our donor. This piece combines leopard jasper, silvertone and red trade beads with thin metal washers and an elongated heart. All the pieces of this work of art are suspended from an approx. 25” leather cord. 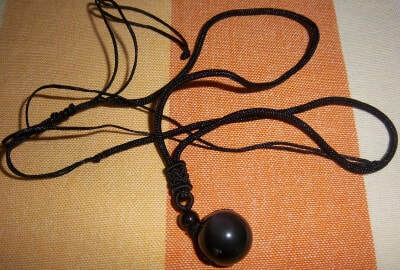 The suspended “pendant” measures 5” from the cord. This is surely a one of a kind! – New on card, removed to take the picture. 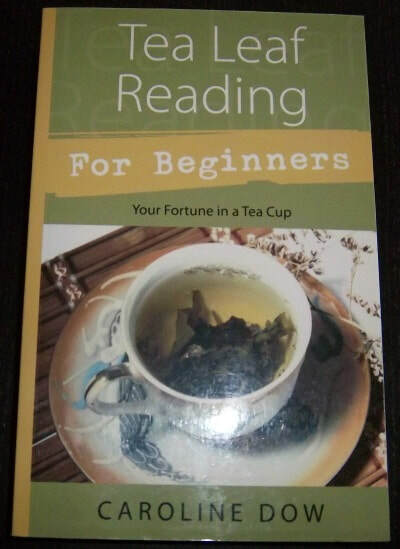 Tea Leaf Reading for Beginners – Your fortune in a tea cup by Caroline Dow. From the rear cover – With a cup of freshly brewed tea, you can indulge in an age old custom that brings you deep relaxation, healthful rejuvenation – and a sense of wonder as you see what the leaves reveal. In six simple steps, You’ll learn to read tea leaves like a pro. The softcover book ($15.95) is in excellent lightly used condition. 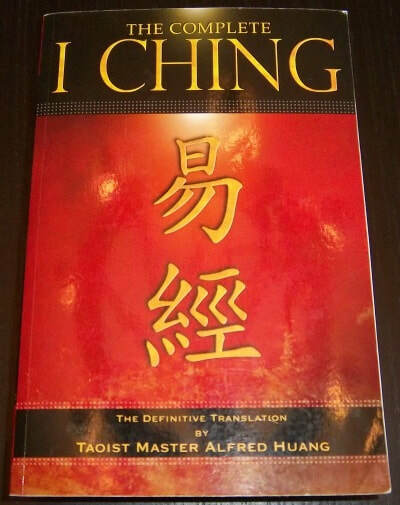 The Complete I Ching – The Definitive Translation by Taoist Master Alfred Haung. From the rear cover – For more than three thousand years the I Ching has been the most important book of divination in the world. The writer has restored the true essence of the I Ching by emphasizing the unity of heaven and humanity and the Tao of change. This is a massive 540 page softcover book ($19.95) in lightly used condition. 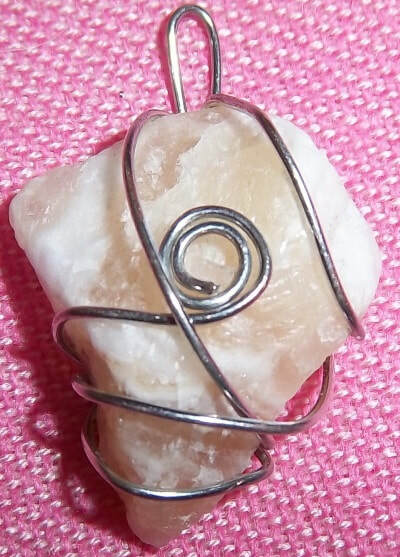 This wire wrapped stone is yellow calcite. Yellow Calcite is the “eliminator” stone for releasing and allowing. Yellow calcite purifies the core and helps the bearer release unwanted energies and patterns. It is ideal for the Solar Plexus Chakra. This wire wrapped piece has a decorative spiral to amplify its work and a loop at the top to add your own cord. The yellow calcite is approx. 1” X ¾”. 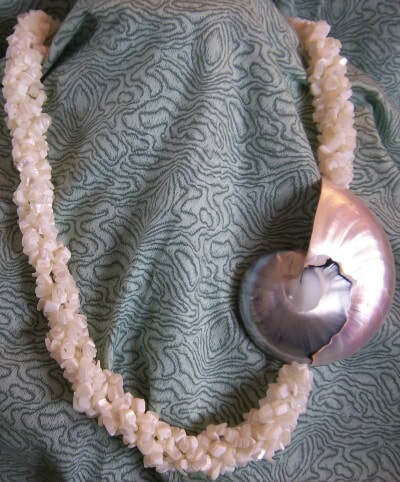 This necklace has a myriad of small white beads in four strands twisted to form a larger necklace terminating at a sliced iridescent Nautilus shell that is worn to the side. The overall length is 26”, the nautilus shell is approx. 3” X 2 ¼”, and as a screw type closure. 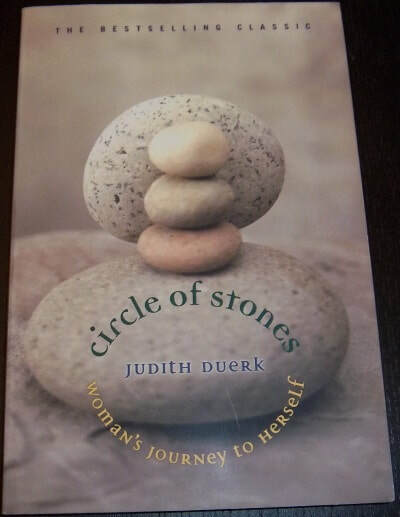 Circle of Stones – Woman’s Journey to Herself by Judith Duerk [15th. Anniversary Edition] From the back cover – Circle of Stones draws readers into a meditative experience and explores our present lives through the prism of women’s ancient culture and ritual. A powerful tool for all women seeking to create and affirm their sacred connections. The revised edition includes exploratory questions and a reading group guide. This softcover book ($13.95) is in like new condition. 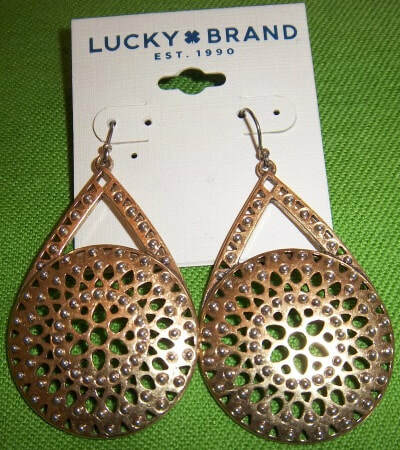 Continuing with this donation from the donor jewelry maker we have a Necklace and earring set. The feather design is on bone to form a three piece matching set. The earrings are approx. 1 ¾” X 1 ½” as is the pendant. The pendant has a 34” leather cord with silver-tone accents and the cord is adjustable with a lapis ring to adjust the length. This set is new on card and bagged, removed only to take the picture. 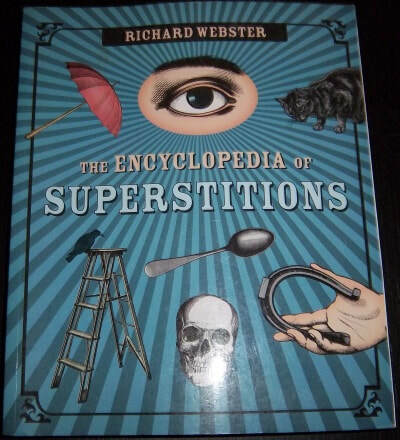 The Encyclopedia of Superstitions by Richard Webster. From the back cover – Trivia fans and fun fact fanatics will adore this fascinating, flickable encyclopedia! Richard Webster presents over five hundred of the most obscure, curious, and just-plain-freaky superstitions of the world. This 310+ page softcover book ($18.95) in lightly used condition has been donated back to this auction from having been won a few years ago. 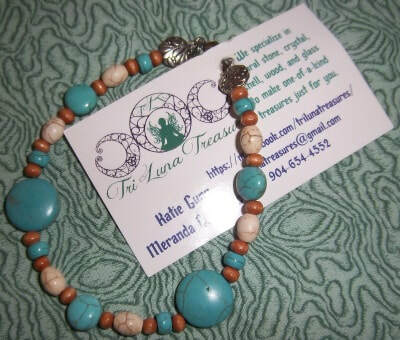 From donor jewelry makers in Jacksonville Florida we offer a bracelet composed of Moss Agate and Fancy Jasper along with a mixture of accent pieces and other beading materials. This combination of woodsy earth tones will surely connect you to nature. The bracelet – new on card is approx. 7 ½” long. 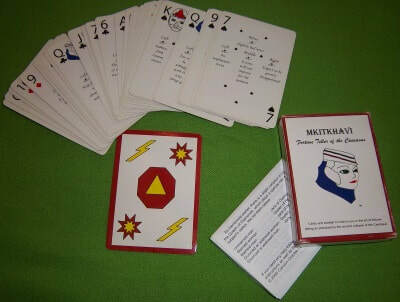 MIKITKHAVI – Fortune Teller of the Caucasus includes the 36 card deck and instructions. From the box – Cards and booklet to instruct you in the art of fortune telling as practiced by the ancient cultures of the Caucasus. This is a small sized deck with the original book in gently used condition. 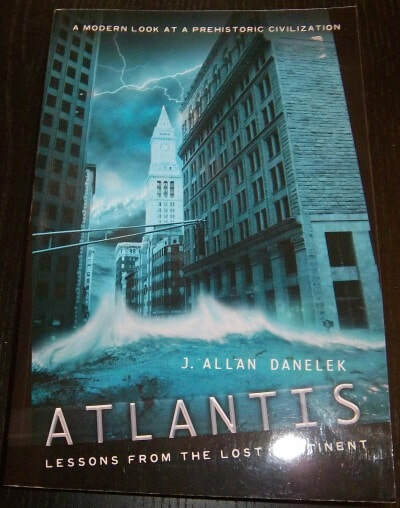 Atlantis: lessons From The Lost Continent by J. Allan Danelek – A Modern Look At A Prehistoric Civilization. Join the author on a compelling journey of discovery as he attempts to answer questions surrounding the controversial twelve-thousand-year-old legend: Was Atlantis a real place or did Plato invent the story? If it did exist, what could have led to the widespread destruction of an entire continent? And are we heading down the same road to self-annihilation? This softcover book is new ($15.95) in excellent condition. This was the orphan from the last Fall auction – maybe this time??? This is an awesome pair of earrings created by the donor: “Raining on Me” The silver-tone skeletons stand beneath a chunk of turquoise representing a rain cloud. What a cool whimsical approach for the earrings, great for a Witches Ball or any occasion. They measure approx. 2 ¼“ from the silver ball below the pierced ear finding. By Land Sky & Sea – Three Realms of Shamanic Witchcraft by Gede Parma. From the back cover – For Witches and Pagans of all traditions and paths, Land, Sky & Sea will help you develop an intimate understanding of the magickal lore and traditions of modern shamanic pathworking. Based upon the Celtic realms of land, sky, and sea, this wise and unique book explores the ancient trinity and its Greek, Hawaiian, Hindu, Stregheria, and Wiccan customs. This softcover book ($16.95) is in like new condition. I called this an Ancestors’ Frame for your altar, but of course you could use is for other purposes. The highly detailed frame is heavy and made of sterling pewter and has a hinged decorative leg in the back for standing. The frame is approx. 7 ½” X 5” with three oval openings to display photos about 2 1/2” X 2”. The frame appears new, but may have been used previously. Bring a little magick into your ritual or altar with this delightful little Aladdin’s style lamp. The lamp is metal with a removable top attached with a delicate chain to the handle. The top of the lamp is reticulated that could allow smoldering incense to waft through your space. However due to the small opening you may not be able to use cones. The lamp measures 5” long X 3” high X 1 ¾” wide. It is in very good used, condition. 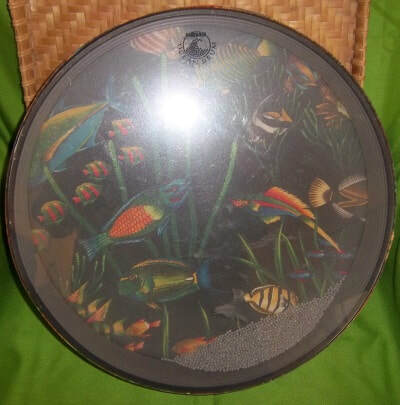 Created by the donor and similar to item #15, this one has the symbol “Attract $$$” etched into the bone convex disc. The disc is 1 ¼” diameter and comes with a 24” leather cord. On the reverse side is written: To attract Money and prosperity. This is new in original packaging, removed only to take the picture. Dream Beads, the concept created by Lady Stephanie helps one to re-examine our daily dreams as you meditate. Hand beaded by the donor using clear glass beads spaced with tiny off white/ pearl beads. Approx. 12” long. Instructions on their use will be included. From Menah’s hands to you the winning bidder, an assortment of the donor’s handmade product. 1. Rosemary Soap, 2. Herbal ritual / soaking “Tea Bag” 3. 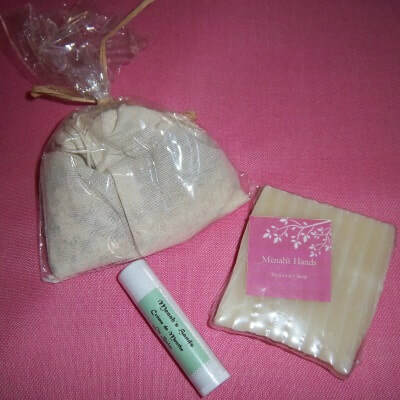 Crème de Menthe Lip Balm. All items are sealed in original packaging. Pendulum Magic For Beginners, Tap Into Your Inner Wisdom by Richard Webster. From the back cover – It’s hard to believe something as simple as a weight on a string can work magic. 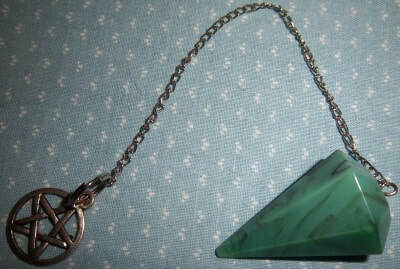 A pendulum is a powerful tool, yet small enough to carry around and use anytime. With just a few minutes of practice, anyone can start using it. This is a softcover ($13.95) book in like new condition. Here we have a Pentacle superimposed onto a Celtic knot background with three deep blue stones, a larger one in the center and two smaller ones to the sides of the pentacle. The pendant is a pewter / metal and comes with a 36+” black cord to size to individual preference. Fortunately this item is flat enough to be able to travel internationally in a regular envelope. ​hosted by Lady of Light - Winston / Salem, NC!! ​Here are donated items that will be a part the in-person silent auction. ​Lots of great items, a sun king afghan / alter cover, feng shui wall decorations and book, more tarot / oracle decks, more jewelry pieces by our donors both hand crafted and retail, altar items and of course more Pagan / Wiccan themed books.